available online or from bookshops world-wide. A North Wales man claims a sinister campaign to silence his important environmental research is being waged against him in the Falkland Islands. He is taking on the authorities single-handedly, saying there have been attempts to frame him and oust him from the country. He has been under false arrest, found a gun planted in his house, received threatening phone calls and his car has been sabotaged. Now a request has been made in Parliament for an investigation into the matter. 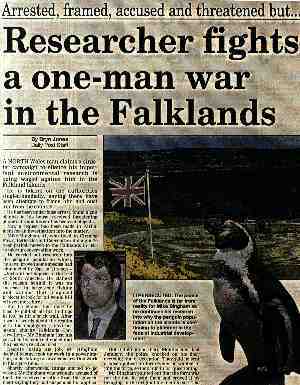 Mike Bingham, 41, moved to the Falklands in 1993 to take up conservation work. He carried out research into the penguin population, which he says proved some species had plummeted by 90% in 11 years - which did not happen in the rest of South America. He claimed the reason behind it was an increase in large-scale fishing and warned that proposed projects to look for oil would kill off even more birds. But he claims that once he tried to publish all his findings in 1997 he hit a brick wall. After a war of words about the results with his employers - environmental charity Falklands Conservation - Mr Bingham lost his job when his contract ended and the post was re-advertised. Despite losing his job, Mr Bingham decided to stay, took up work in a power station, undertaking his conservation work in his spare time. Shortly afterwards things started to go wrong. Mr Bingham was wrongly accused of theft. He received a letter from the government saying they had suspended his application to live permanently on the islands because of the theft accusation. When Mr Bingham proved the accusations were all false he naturally thought the suspension would be lifted. Instead, it was increased from three months to two years with no reason given as to why. When Mr Bingham returned home one day after doing some research he was convinced someone had been inside his house. Nothing was missing, so he did nothing about it. Two weeks later, while searching for documents under his bed, he found a pistol and two boxes of bullets. He said: "I disposed of them straight away and made an appointment to see the Governor. I explained I was getting concerned things might get serious, but didn�t say anything about the pistol. I told the local paper that my house was going to be searched, then a couple of weeks later that�s exactly what happened. Customs officers came to my room and said they had grounds to search my premises because they had found a pornographic video sent to me during a routine check in the post office." Mr Bingham believes someone tipped-off customs about a video they had posted to his house - sent from an unknown address in Britain - hoping it would then lead them to the gun they had planted in his house. But it did not end there. Months later, last January, the police knocked on his door accusing him of deception. They said he sent a false application form when he wanted to join the force, so took him in for questioning. Mr Bingham pointed out that the form was not the one he sent them and proved it by bringing in the original for them to see. The police denied it at first, but later said it was an administrative error. During this time Mr Bingham started receiving threatening phone calls. One man phoned him warning him customs officers had information about him and suggested he get out of the country "before it gets nasty". Officers did call - at his workplace - and arrested him for being a criminal with convictions for affray, burglary and car theft over a 15-year period when living in Britain. He was interviewed and his fingerprints sent to Interpol for checking. They phoned back saying the convictions were for a man two years older than Mr Bingham and with a different middle name. They also pointed out that they had already told the Falklands Police all this just two months previously. But the mud has stuck to Mr Bingham. He has been spat at in the street, had a cat�s head stuck over the doorway of his home and had his car engine filled with petrol. He believes there are too many bizarre events to be put down to coincidence, and thinks certain people would rather see him back in North Wales. Neither the Royal Falkland Islands Police nor the Falkland Islands Government wished to comment.